4 USB port a type upto 400 ma & Automatic current sharing by device request..
With Power input hole. Individual Port over current protection..
Chains up to 127 USB devices..
With LED indicator / ON-OFF switch..
All Logos and trade marks on the product and gifts box are the registered trade marks of their respective companies. Agrima 4 Port White USB Hub with LED Indicator & Switch is a premium quality USB Hubs & Cleaning Kits from Agrima. Moglix is a well-known ecommerce platform for qualitative range of USB Hubs & Cleaning Kits. All Agrima 4 Port White USB Hub with LED Indicator & Switch are manufactured by using quality assured material and advanced techniques, which make them up to the standard in this highly challenging field. 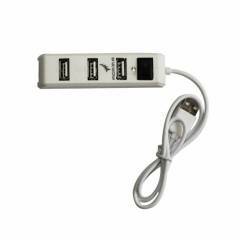 The materials utilized to manufacture Agrima 4 Port White USB Hub with LED Indicator & Switch, are sourced from the most reliable and official USB Hubs & Cleaning Kits vendors, chosen after performing detailed market surveys. Thus, Agrima products are widely acknowledged in the market for their high quality. We are dedicatedly involved in providing an excellent quality array of Agrima USB Hubs & Cleaning Kits.